Happy St. Patrick’s Day! I was so tickled to create these cute pots of gold for my 2-year-old class I teach every Monday at my Classical Conversations group. These kids have been so cute all year long and really soaking up every subject we’ve been learning about. So I really wanted this year to be a time where I could teach them who St. Patrick REALLY was and what the day really signifies. Whether you are Irish or not, chances are you might now know that the holiday is more than being pinched if you don’t wear green and that it is not about luck. To explain this, I “read” by summarizing the pictures of this book I found from Voice of the Martyrs called, “St. Patrick: More than Shamrocks and Leprachauns.” I never realized how much his story parallels Joseph in the Bible who was captured and sold as a slave. Except that St. Patrick was sold as a slave, escaped to return to his family, and obeyed God to go BACK to the land where he could have been hurt for his faith just to tell them to “trust in the Lord with all their heart” and that “nothing is impossible with God.” Wow! I know there is more to his story than even this. But to convey just this much to 2-year-olds is awesome. They get it. My 8-year-old was all over it too. 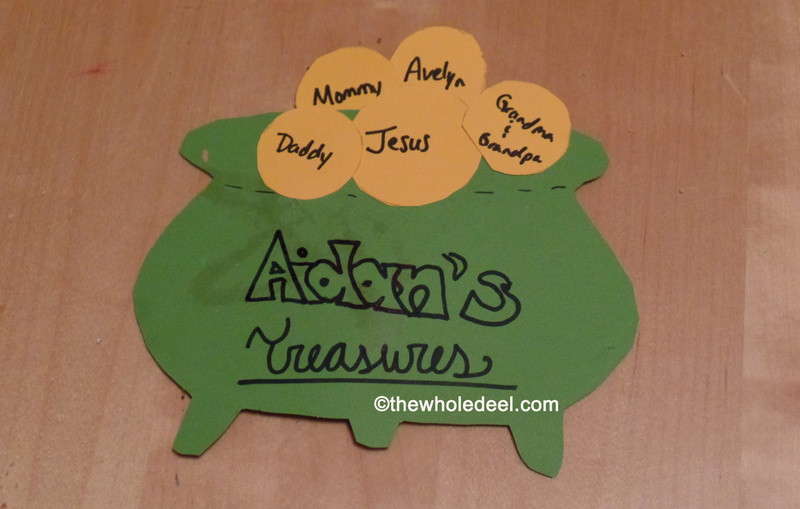 After the story, we talked about how God wants us to store our treasures in heaven. So we made pots of gold with each child’s treasures: Jesus and each of their family members… people they will all see again in heaven. But I really loved one girl treasured “learning”… and I think that’s a treasure to totally store in heaven! click here to get these FREE printables for the pot and Matthew 6:20 quote from ChristianPreschoolPrintables.com. You can see my idea from happyhomefairy.com. For the coins, I just traced a circular bottle and cut them out. I think the part the kids in my class liked the most, was the “stickers” I made them from the .pdf file available at Made2BCreative.com’s blog. Her whole blog is filled with great printables. Of course, this post would not be complete without mentioning the AMAZING corned beef, cabbage, potatoes, and carrots my husband brought home from Cracker Barrel tonight! All of us kept saying, “YUM!” Gluten-Free. The kids easily understood that the wee bit of Irish in them from my side of the family is equally as fun as it is delicious. How does it get better than that? 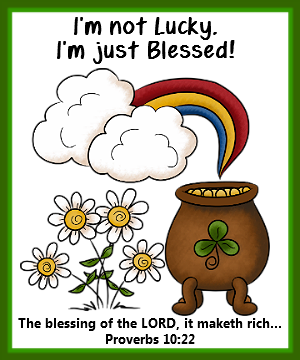 Have a Blessed St. Patty’s Day!